Is Snoring just a Joke? Consultant Physician, Battle Hospital, Reading. Doctors who are interested in sleep related breathing disorders and run sleep clinics can see a very wide variety of abnormalities ranging from life threatening problems to simple bad habits! In this article we will consider normal sleep patterns together with snoring, sleep related breathing disorders and the condition called obstructive sleep apnoea. We shall see how our normal sleep patterns may be disturbed by jet lag and shift work. Finally, advice will be given about how best to obtain help. The natural rhythm of sleep. Nature tends to follow certain rhythms. The spinning of the earth around its own axis dictates a daily rhythm, the moon has a monthly influence and the rotation of the earth around the sun determines the seasons. In common with all other animals we have our own in-built natural rhythms. For example, we have a spontaneous circadian daily rhythm and the reproductive cycle has a monthly rhythm. Curiously, our daily rhythm is approximately 25 hours and is reset to 24 hours by the time clues given by our environment. During this 24 hour cycle there are two periods when the ability to fall asleep is greatly enhanced. This is maximal at about 2 p.m. and between 11 p.m. and 5 a.m. 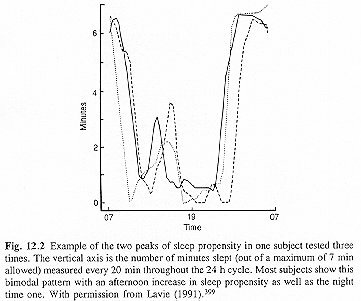 These periods have been described as sleep gates and are shown clearly in the figure below. At other times sleep may be almost impossible even when feeling sleepy - the so called forbidden zone. These gates vary between individuals both in their exact timing and intensity. For this reason sleep is not usually possible at all times during the 24 hour cycle. Here lies the explanation for jet lag and problems encountered with shift work. The disrupting effect of shift work upon people's lives is of enormous importance. [Akerstedt T. Sleepiness at work: effects of irregular work hours. In: Monk TH. ed. Sleep, sleepiness and performance. Chichester, UK: John Wiley & Sons, 1991: 129-52.] You do not have to look far to find a shift worker such as a nurse who will confirm this! Constant changing of shift can be detrimental to alertness and well being. Certain shift patterns are worse than others. An 8 hour shift rotating onward each week is much less destructive than one rotating backwards. The forward rotation has much the same effect as a westward flight to America each week whereas the backward rotation is akin to an eastward flight. There is evidence that the forward pattern is associated with less absenteeism and staff turnover than the backward one. [Czeisler CA. et al. Rotating shift work schedules that disrupt sleep are improved by applying circadian principles. Science 1982; 217: 460-3] Nurses often have chaotic oscillations between shifts having days off after night duty but not before. They rarely sleep the day before going onto night duty and by the end of their first night they have effectively had a whole night of sleep deprivation. A quite common but often unrecognised occurrence is what is called the delayed sleep phase syndrome. If bed time is delayed (similar to a westward flight) the circadian rhythm will elongate quite readily. After a few nights of later bed times, but the same wake-up time, sleepiness will develop. This may lead to an attempt to re-establish the earlier bed time. This can be difficult because the sleep gate may no longer be that early and sleep will only occur later on. Trying to drag back sleep onset to its previous point can be very difficult owing to the reluctance of the body to accept a shorter than normal circadian rhythm. Thus a pattern becomes established of inability to sleep until 2 or 3 a.m., difficulty getting up in the morning and daytime sleepiness. Most parents are only too familiar with this pattern! Snoring and the disturbance it causes used to be (and frequently is still) regarded as a joke, about which little could be done. We now know that snoring may be a pointer to abnormalities with breathing at night which may be harmful to the health of the snorer. During sleep all the muscles of the body relax and become more floppy. With relaxation of the muscles which help hold open the throat, a partial collapse and narrowing results. Even in non-snorers this narrowing increases the resistance to the flow of air when breathing in but is usually of no significance. When the narrowing during sleep is greater than normal, the airway behind the tongue may collapse transiently. This gives rise to a fluttering of the throat tissues producing sounds which we recognise as snoring. Should the collapse be complete and longer lasting, no air can be drawn into the lungs and the sufferer is literally without breath - that is experiencing apnoea. Were this situation to persist, the individual would asphyxiate! Evolution has equipped us with a remarkably sensitive ability to detect impending throat closure. This ability does not seem to be influenced by the depth of sleep. Had we not developed this mechanism the human race would have choked to death in the night and joined the dinosaurs a long time ago! So our snorer, sensing impending doom, rouses briefly, avoids suffocation, takes a few deep breaths and rapidly returns to sleep. This pattern may be repeated 300 - 500 times during the night without recollection in the morning! It is the fragmentation of the normal sleep architecture consequent upon these arousals which is the cause of the daytime symptoms of tiredness and drowsiness with diminished alertness and performance. Our understanding of why we sleep is remarkably poor. [Horne J. Why we sleep. Oxford: Oxford University Press, 1988.] The only obvious reason we sleep is to prevent sleepiness! It appears that we need about two hours worth of quality deep sleep to remain alert and function at our best during waking hours. It takes time to drift down into this stage of sleep and we collect it in chunks - a few minutes here and half an hour or so there. As long as the overnight aggregate is about 2 hours we wake refreshed by our sleep. With fragmentation of the sleep pattern due to multiple arousals it becomes impossible to harvest the required two hours of quality sleep. Little wonder that after even more than ten hours of so called sleep, sufferers describe themselves as feeling shattered on waking! It can be conceived of as equivalent to the telephone having rung hundreds of times during the night. Because sleep can be so disrupted by the body having frequently to rouse briefly to reverse the upper airway obstruction, sufferers experience severe daytime sleepiness. To start with this occurs only during potentially boring activities such as reading, watching television or driving on motorways. However when the sleepiness gets worse it begins to interfere with most activities, with the individual falling asleep talking or eating. Poor work performance can lose the sufferer his or her job and of course sleepiness whilst driving can be fatal (sleep apnoea sufferers are about seven times more likely to have car accidents). Snoring will usually have been present for many years and have gone well beyond a joke within the family. There are many other symptoms, as one might expect in someone who is seriously sleep deprived, (irritability for example) but the twin symptoms of snoring and daytime sleepiness are the best pointers to the diagnosis. The severe morbidity of sleep apnoea coupled with the ready availability of effective treatment means that recognition and diagnosis are important. Already public awareness is increasing following press and television publicity but much remains to be done to increase this awareness. The presence of significant sleep apnoea may be strongly suspected from the symptoms. Snoring, excessive daytime sleepiness, early morning headache and poor concentration should alert patient and doctor alike. These symptoms may be embarrassing or be attributed simply to laziness or ageing. Often the individual's partner has read an article about sleep apnoea and recognises the problem. Often the diagnosis of sleep apnoea can be made on the basis of the history alone. Confirmation of the diagnosis by means of some form of study is important. Unlike most medical problems which can confidently be diagnosed from history and physical examination alone, with sleep apnoea these traditional methods are poor indicators of the severity of the underlying problem. A variety of things can be measured during sleep without having to use any painful needles or devices. The above simple investigation may be supplemented by a continuous overnight video recording (under infrared light) along with audio recording. Processing of the video signal allows movement to be detected and analysed. Computer analysis of these records allows a rapid review of an overnight recording to identify periods of abnormal sleep and the times at which they occur. The corresponding times on the video recording can then be inspected to clarify the diagnosis. In recent years there has been a move away from the complex multiple measurements known as polysomnography. This involves the application of electrodes over the brain along with sensor devices detecting chest and limb movement along with devices to detect air flow through the nose. These highly expensive and labour intensive techniques are now used only rarely in the UK. Full polysomnography misses snoring induced arousals and is no longer regarded as a good gold standard. It is essential that treatment is tailored to the patient's needs. Treatment is focused upon correcting the daytime symptoms which result from sleep fragmentation. When the sleep disturbance is not severe simple approaches can help. Losing some weight, not drinking alcohol after 6.00 p.m. (alcohol relaxes the upper airway muscles even more), keeping the nose as clear as possible, and sleeping on one's side or semi-propped up can all help and sometimes be dramatically beneficial. Carefully chosen individuals can be helped by simple dental devices which slightly advance the lower jaw during sleep and help to keep the airway open. In selected cases medication can be very effective. When snoring is very objectionable, with the individual and the partner desperate for a solution, then an operation on the back of the throat may help - but this is a very last resort and should only be done when a sleep study has shown snoring alone with very little, or no, sleep apnoea. Surgery has NOT been shown to be beneficial for people with sleep apnoea and is best avoided for this condition until we learn more about the mechanisms behind it. The worry is that some patients treated surgically for apnoea have been made worse. Also, the permanent alteration of the throat structure denies the individual the benefit of the definitive treatment of nasal CPAP. The only clear indication for surgery is the removal of enlarged tonsils which obstruct the airway. If any of the above has a familiar ring for you or those close to you, how should you seek help? Until recently there was only a handful of sleep centres in the UK. However, there is now an increasing interest in these problems and more and more hospitals are setting up sleep units. There should be a sleep unit within relatively easy reach of where you live and referral via your General Practitioner is the standard method in the UK. Should you encounter problems then contact the British Snoring & Sleep Apnoea Association which keeps a record of all sleep centres in the UK and can advise you of your nearest centre and how to seek referral. The British Snoring & Sleep Apnoea Association, How Lane, Chipstead, Surrey CR5 3LT.